It has been over two years between Nelson DeMille books, which is way too long. His latest, THE CUBAN AFFAIR, is classic DeMille with its action packed story, fact based plot, witty characters, and humorous dialogue. In this, DeMille’s twentieth novel, he has Daniel (Mac) MacCormick adjusting to civilian life. After serving two tours in Afghanistan he has sought out a more peaceful lifestyle in Key West Florida. He is now a charter boat captain of a 42 feet deep-sea fishing vessel, The Maine, which takes tourists and fisherman on excursions. Having made a name for himself and needing his military skills, three Cuban-Americans make him an offer to have the Maine participate in a ten-day fishing tournament to Cuba. But the real reason they need him is to help find and return sixty million dollars left behind by the refugees. The covert plan is to embed Mac and one of the Cuban-Americans, Sara Ortega, into Cuba as part of an educational tour under the auspices of Yale University. The action ratchets up as Mac and Sara are on the run from the Cuban authorities and need his first mate, gruff seventy-year-old Vietnam veteran, Jack Colby, to help in the rescue. Readers of DeMille expect historical facts and details intertwined within the story. In this book it is no different. Having gone to Cuba himself as part of the Yale University-affiliated educational tour he was able to get a personal eye view of what Cuba is really like. He wants readers to be entertained, but also to learn something, especially since many have forgotten about the Castro Brothers’ actions. 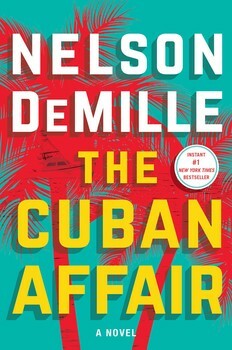 The Cuban Affair is a gripping novel that has relatable and likeable characters. As with all his novels, people will be immersed in the setting, culture, and history. Hopefully this will be the first in a series of books involving these characters that will include plenty of action, political intrigue, romance and dry wit.